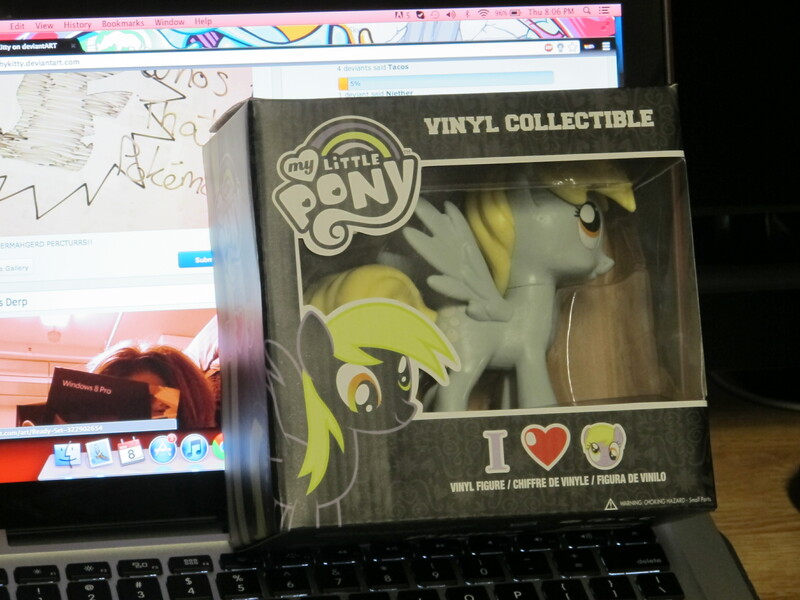 Today, I walked into a HotTopic and bought... well, you can see. I've got one too! She's sitting on my book shelf with all my McDonald's ponies! Ooh! I got it! Dragon Ball Kai's Lord Freiza for King Sombra! Also, I'm suddenly imagining the magic duel between Twilight and Trixie going like that. I think we can all agree that's the best thing ever. Of all time. Edit: also, BEHOLD! 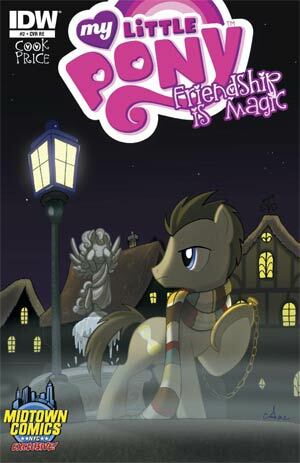 MY MLP/Avengers story! I enjoyed that dancing. especially Octy's forced smile for most of it. It's only 2 strips so far, but I like them both. Does anyone else find it amazing how much character we fans have been able to put into these background ponies? Someone just coming into the show and only having seen a couple of episodes might not even realize that they're JUST background ponies! Hey, where do I go online to watch the live stream for Saturday morning? It has been my experience that the episodes appear on youtube within an hour of the original broadcast. You may not be able to immediately join in any discussion due to the delay, but it is a reliable method. As for a stream I'm sure a link to one will be up on EQD before it airs, or you can always check 4chan's pony board they will have one (or more likely more then one) for sure. Back. Bringing you another mesmerizing pony GIF. Just makes you wanna surrender your will and never close your eyes or move them anywhere ever again. Okay, so, I've been busy as of late. Doing what? Writing. I know, that's usually Penwrite's thing, but I got drawn into doing something, and through that something, I got in contact with someone. Now, this someone introduced me to their Fic, Becoming Fluttershy. This is part of something called a "'verse." After hearing the concept of a 'verse, I said that it's an interesting concept. This led to me being asked if I was a detail oriented person. I happen to be obsessive compulsive, so the answer was "Yes, I am." I was then asked if I was fine with writing as Twilight, but without all her power. My response was "I don't even know how to use magic, so it'd make sense I wouldn't have her power." Now, what I didn't know at the time was there was already a writer for Twilight, who has been saying "Magic is powered by imagination." Now, I'd be nice about it, but nice isn't my nature. The writer has very little imagination. This doesn't seem to stop them from writing Twilight with more power than she actually has though, and it's been shown doing way more than magic should. Example: Creating objects out of thin air. There's now some sort of plot twist that makes two Twilights. This being said, I got a late start, and now I'm writing as much as I can to catch up to the line. Now, I'm here for some shameless self-advertising. Why am I doing shameless self-advertising? Simple. Thought you guys might like to know what all things I'm doing related to MLP as well. Sleepless in Ponyville synopsis Scootaloo Episode! YAY! Oh my gosh! I thought this day would never come! Also, leaf, writing is my thing? I have a thing now? Cool! EVERYONE BOW DOWN BEFORE YOUR NEW WRITING OVERLORD! I need links! Links to the episodes! Sadly I wasn't at home when it aired, so I'm in the wait of a charitable soul to upload it. I'm also waiting on Youtube links. I meant to get up early enough to watch the streams on EQD, but for some stupid reason when I woke up, my mind decided that it was starting at 10:30, rather than 10:00. So I just sat in bed until ten after and when I opened the stream, I'd already missed over half of the first episode. So yeah. Also! I meant to plug this the other day, but didn't think to: We Didn't Start the Bronies. A song that a group I'm in put together a little while back that, due to some complications, barely managed to get the track mixed before S3 aired. It's a ponified version of We Didn't Start the Fire by Billy Joel, basically covering some major points for the brony fandom. I sang the verses myself, and a couple of the girls took background vocals for the choruses and some random points in the verses. It's not the greatest quality (since we were short on time, the leader of the group handled the mixing instead of our designated mixer; he's getting better though! ), but it was really fun to do, and I'm still proud of it either way. :) Feel free to check it out and give us some love! It's a ponified version of We Didn't Start the Fire by Billy Joel, basically covering some major points for the brony fandom. I sang the verses myself, and a couple of the girls took background vocals for the choruses and some random points in the verses. It's not the greatest quality (since we were short on time, the leader of the group handled the mixing instead of our designated mixer; he's getting better though! ), but it was really fun to do, and I'm still proud of it either way. Feel free to check it out and give us some love! It's out on youtube already. check the link I posted. Overall, it was an enjoyable episode. However, King Sombra was definitely the most underwhelming villain we've had on the show so far. Last edited by mariomarc on Sat Nov 10, 2012 2:35 pm, edited 1 time in total. They really didn't bother to give King Sombra much of a personality. I don't think he can be compared to the likes of Discord or Chrysalis. Poor Fluttershy. Jousting just isn't her thing. I liked it, but I agree, King Sombra was underwhelming. They could have gotten rid of him and left it as an ominous black smoke, perhaps the last trap left by him before they got rid of him. also, either less than a year has passed since the season one opener, or they like rounding to 1000 years. Cause Sombra was overthrown by both Celestia and Luna, but 1000 years ago Luna was on the moon already. I feel the exact same about this that I did about the royal wedding. It was a movie worthy concept that was forced into a 40 minute block and would have done much better to have been expanded upon. To me, it seemed rushed at times (Well, most of the time). And I find the whole thing with Twilight being graded on how she preformed during this was just silly. She's basically saving the world (Again), and being given a grade on how she did while doing so just didn't sit too well with me. A great chance to have a quality villain, but they never did anything with him. He could have done really well if they had given the chance to characterize him some. Show his motives for ruling over the Crystal Ponies the way he did. Heck, even given him an actual line or two. I feel the same way about Chrysalis and not having given some time to characterize her, but at least we got enough that most people could probably agree how she would sound if you were to talk to her. They did an excellent job with Discord when they did him, and to the point I consider him my favorite villain ever. Chrysalis just didn't have enough for me to really like or dislike (I'm still waiting for her to return). But Sombra just wasn't there at all. He was a shadow the entire time and gave off a super evil kind of feel, but was that kind of evil always there or did it form over the 1000 years he had been a shadow? You didn't get a feel for him at all. I just feel that, once again, they had a really good idea that should not have been forced into 2 episodes and should have instead been a movie. no hate here, I agree. even before I got to the second episode, I actually thought "there's no way they can satisfactorily do everything they should in the time they have left." I enjoyed the episode, but it could have been better. And Sombra was just a smoke monster, I was hoping for more. Since he inspires hate, fear and other negative emotions, his final act of revenge was to infect Luna's mind with jealousy and resentment. The same jealousy and resentment that turned her into Nightmare Moon. Celestia and Twilight showed off some ability to preform dark magic. I wonder if that will have some nasty side effects for either of them. I know I'm going to be in the minority here, but I have to be honest: I think King Sombra is my favorite villain of the show, and possibly the best villain the show has had. First of all, he was unlike any of the other big villains. He didn't waste time proclaiming his superiority or making grand speeches like Nightmare Moon and Queen Chrysalis did, he just went straight for his goal. He never once underestimated his enemies or got overconfident once victory seemed assured like... well, like every other villain has so far. He set up traps for anyone trying to reach the Macguffin that lasted a 1000 years, and would have absolutely succeeded if Twilight had been on her own like she planned. And then, let's really think about what he was for a moment. King Sombra was a UNICORN. Not a corrupted alicorn, not a god of chaos, not the equivalent of an alicorn from another race, just a really evil, really powerful unicorn. And yet, the first time it took the combined might of Celestia and Luna to defeat him, while the second time around the whole struggle was to KEEP him from fully coming back. And finally, of course, there's the fact that, out of all MLP generations, out of all the villains there have been, Sombra is only the second ever to actually be killed. That by itself is awesome. Am I annoyed that he got so little screen-time he got? Oh yeah, totally. He was way underused. But I wouldn't say he was a terrible villain at all. As Penwrite said, King Sombra was a very effective villain in his own way, since he didn't waste time gloating. This is a major thumb up for him. But, sadly, he didn't have much to offer in terms of personality. You know, maybe that's why he was featured so little. Sombra was TOO effective a villain! And oh yeah, I loved that scene with Spike! It calls all the way back to Owl's Well that Ends Well in season one, when Spike thought Twilight didn't love him anymore. Which, I actually consider to make more sense as a worst fear than the greed thing. Mostly because, being a dragon, he will certainly outlive Twilight and all the other mane 6 (unless the alicorn theory proves correct). Also, Spike's worst fear being him acting greedy again wouldn't quite work, as that would require changing his personality to greed again, in which case Spike wouldn't be suffering anguish from fear at all. The spell has to be subjecting the victim to something. When I mentioned greedy spike, I'm not talking about the fear of being huge again per se. Remember that in the end of the episode Secret of My Excess, spike looked at the destruction he caused and his huge paw print? What i mean is his fear of hurting his friends by accident and then be thrown out in the cold because of that. Ah. You... probably could have worded that better the first time then. But anyways, if that's what you meant, then what we're both calling his greatest fear boils down to the same thing: rejection and loneliness. In the owl episode, Spike accidently burned one of Twilight's books, lied about it, got found out and yelled at by Twilight, and left Ponyville in despair. Not counting the actual cause, greed, the events of Excess are basically the same: Spike does something terrible and feels anguish over it, perhaps fearing rejection again, but instead this time he's immediately forgiven. Either way, rejection and loneliness are Spike's greatest fear... and I'm seriously over-analyzing this little girl's show, aren't I?